structures? What types of frequency is used in medical ultrasound and why is this important? 2. How is the ultrasound used in medicine produced? 3. How is the ultrasound reflected by the body strucutres detected? 4. What is acoustic impendence? How does acoustic impendence affect the ultrasound scan? 5. What does the A in A-scan stand for? How is it produced? 6. What does the B in B-scan stand for? How is it produced? 7. What are the advantages and disadvantages of ultrasound used in medicine? 8. What is real-time B scan? What is doppler ultrasound? a body structures? What types of frequency is used in medical ultrasound and why is this important? Whenever a sound wave moving in air hits a solid surface, it reflects off it. This reflected sound is called an echo. The same applies to a sound wave moving through water and hitting an obstacle. As this is the total distance that the sound has travelled to the object and back, we must divide by 2 to find the one-way distance. This use of echoes is the basis of sonar (sound navigation and ranging). The pulse of sound that is used should be short, and high frequencies are usually used, as they travel further without being absorbed. Sounds with a frequency above 20 kiloHertz (20 kHz) are called ultrasonic (beyond the range of human hearing). The sounds used for sonar are well into the ultrasonic range, with frequencies of 1 - 20 megaHertz (MHz). In solving problems on sonar, remember that the speed of sound itself varies from one material to another. The speed also depends on temperature, pressure and other factors. Typical speeds are approximately 330 m/s in air, 1500 m/s in water and 5000 m/s in a metal. The frequencies of ultrasound required for medical imaging are in the range 1 - 20 MHz. These frequencies can be obtained by using piezoelectric materials. When an electric field is placed across a slice of one of these materials, the material contracts or expands. If the electric field is reversed, the effect on the material is also reversed. If the electric field keeps reversing, the crystal alternately contracts and expands. So a rapidly alternating electric field causes the crystal to vibrate. The vibration is largest when the electric field stimulates a natural frequency of the crystal - this is an example of resonance. The vibrations are then passed through any adjacent materials, or into the air as a longitudinal wave i.e. a sound wave is produced. The piezoelectric effect occurs in a number of natural crystals including quartz, but the most commonly used substance is a synthetic ceramic, lead zirconate titanate. The crystal is cut into a slice with a thickness equal to half a wavelength of the desired ultrasound frequency, as this thickness ensures most of the energy is emitted at the fundamental frequency. The piezoelectric effect also works in reverse. If the crystal is squeezed or stretched, an electric field is produced across it. So if ultrasound hits the crystal from outside, it will cause the crystal to vibrate in and out, and this will produce an alternating electric field. The resulting electrical signal can be amplified and processed in a number of ways (see questions on A-scan and B-scan). So a second crystal can be used to detect any returning ultrasound which has been reflected from an obstacle. Air and water have very different impedances, so that a beam of ultrasound hitting a water surface is almost entirely reflected away, and only a small amount enters the water. The same applies to a beam trying to enter the eye from air. Because of the impedance difference between air and skin, a coupling medium helps to match the impedance of the crystal in the probe more closely to the the impedance of the skin of the patient. The most common coupling medium is a film of oil smeared on the patient's skin. The operator requires needs to ensure that the probe is kept in continuous contact with the oil, preventing air bubbles coming between the probe and skin. On the other hand, different body layers such as fat, muscle and many body organs, have very similar impedances, so that most of the beam will pass from one layer into the next, and only a small fraction is reflected. In practice, this is not a problem; in fact the imaging technique relies on it. 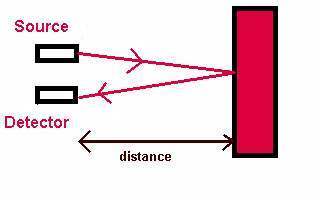 To obtain a reasonable image with good resolution of an interface between two layers, around 1% of a beam must be reflected, leaving a substantial portion to continue on to further reflections. amplitude of the reflection i.e. how strongly the sound is reflected. Each layer producing a reflection shows up as a peak on the trace. This gives rise to the name of the technique, an amplitude-scan or A-scan. 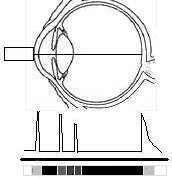 The diagram below shows an A-scan which could result from the layers in the eye (this should be familiar to all ophthalmologist ever performs biometry). The amplitude of the peaks depends on the difference in acoustic impedance between the tissues on each side of each boundary. It also depends on how much of the sound is absorbed as it travels through each layer, an effect which complicates the interpretation of the scan. 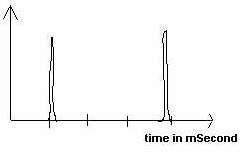 In this method the amplitude of each returning signal is not simply displayed on a graph or CRO screen. Instead the amplitude controls the brightness of the spot which represents this reflection, the b for brightness giving rise to the name B-scan. So a single pulse of ultrasound passing into a series of tissues will give rise to a series of spots, with the brightness of the spots corresponding to the amplitude of the reflection from different layers. The corneal spike and the retinal spike have the biggest amplitude and therefore appears nearly white. 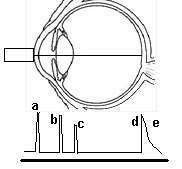 The posterior lens spike has a lower amplitude than the anterior lens spike and therefore appears darker. The aqueous and the vitreous allow the sound to pass through with little impendence and therefore appears black. The lens subtance offers some resistance and therefore does not appears as black. which may involve much more patient discomfort as the probe is inserted. X-rays or MRI scans. The equipment can be made portable, and the images can be stored electronically. passes, but there are still many situations where X-rays produce a much higher resolution. is obtained by an MRI scan. Real-time B-scans allow body structures which are moving to be investigated. The simplest type of scanner is just a speeded up version of the 2-D B-scan , allowing a rapid series of still pictures to be built up into a video of the movement. More sophisticated systems have an array of transducers rather than just one pair of transmitter and detector, and the current image is combined by computer with a recently stored image to improve the overall quality. When ultrasound is reflected from a moving surface, the frequency of the sound is altered slightly in a manner that depends on the speed of movement of the surface. This is due to the Doppler effect. The Doppler effect is now commonly used in ultrasound imaging to examine the movement of liquids, such as blood flow inarteries and veins, allowing the location of blockages to be determine precisely. Another common medical application is in foetal heart monitoring.